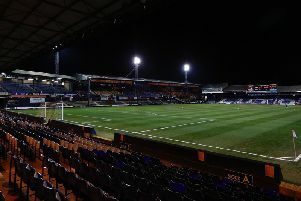 Luton Town have made their second signing of transfer deadline day by bringing in Leyton Orient striker Ollie Palmer on loan until the end of the season. The 25-year-old former Grimsby and Mansfield forward, who stands at 6ft 5ins tall, scored against the Hatters in Town’s 2-1 victory at O’s in October and will give Town boss Nathan Jones another option to his attacking ranks. We are really happy with the strike force we’ve got now, and Ollie will only enhance that. Although Palmer hasn’t joined in time to feature in this evening’s clash with Cheltenham Town, the Luton chief told the club’s official website: “We felt we needed something different, so we earmarked Ollie. “He’s a player we’ve liked for a long time and our focus has often been on him in the build-up to our games against Orient. “He’s done well against us in the games too, so when the chance came up to get him in, we took it. “With his size, he’ll give us a different option in terms of physicality. “We have a lot of pace and ability to get in off defenders’ shoulders, but we felt we needed more of an authentic target man to play up there. “We are really happy with the strike force we’ve got now, and Ollie will only enhance that.